Our 2019 Vacation Bible School “Totus Tuus" will be held the week of July 28 - August 2. The week will include catechetical instruction, daily Mass, songs, games, and recess for elementary students, ending with the popular water fight! Jr/Sr High students will learn to develop a deep personal relationship with the Lord, catechetical instruction on relevant topics to young people today, an evening of Adoration, opportunity for the Sacrament of Reconciliation, and a night of fellowship. The team members are college students that travel around the Diocese of Duluth for the summer. Their youthfulness, energy, and ability to witness to the Faith make them effective teachers and extremely fun! This VBS is open to all students, Catholic and non-Catholic. Students in grades 7-12: Sunday, July 28 – Thursday, August 1, from 7:00 PM to 9:00 PM. FOOD: Elementary students are asked to bring a bag lunch. 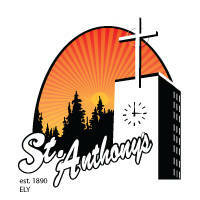 Beverages and snacks will be provided for by St. Anthony’s.